Would you like to spend more time each year in the wilderness? 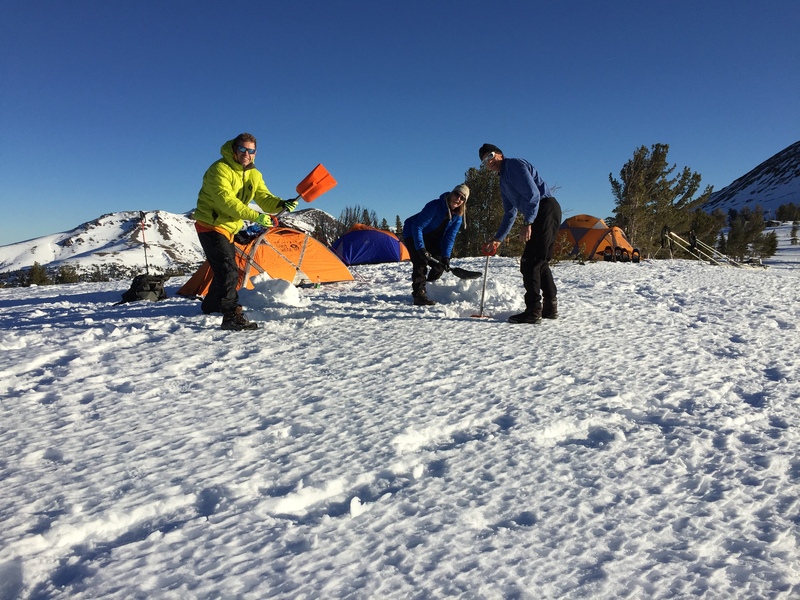 Are you concerned about camping in the snow and getting cold, wet, or lost? 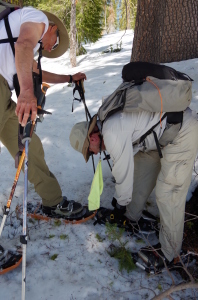 Do you feel that, if the trail is buried under snow and you can’t see where it goes, you need to call for help? Distance, Gain, & Elevation: 3 miles, round-trip; elevation gain, 250 feet; max elevation, 8,800 feet. How: Apply, be approved, check Gear List, donate to the mission of the school, if you want, read email, show up, have fun! Cost: These classes are available to the public to promote wilderness safety awareness, personal skills confidence, and overall mountain “savvy.” A donation to this charity that provides it is suggested (donation, $80*). * Mountain Education, Inc. is a public charity under section 501(c)(3) of the Internal Revenue Code, ID # 47-1263156. 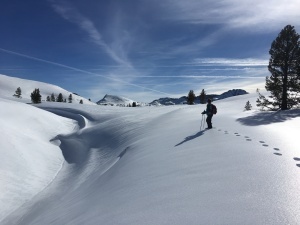 If you want to learn how to explore the winter wonderland without worry that you’ll get lost, wet and cold, dehydrated, or just fall down and get hurt, and you don’t want to camp out in the snow just yet, we have a surprise for you! New for 2018, we are grouping our usual 1-day clinics (above) into 2-day weekend seminars and basing them at the historic Clair Tappaan Lodge on Donner Summit! There will be indoor classes on specific wilderness safety topics and outdoor walks, talks, and skills pr actice sessions. 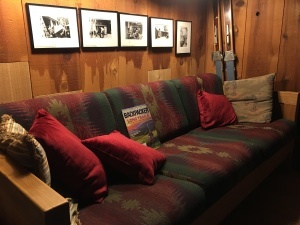 The lodge takes care of your hostel-style accommodations and 3 meals a day while Mountain Education provides the teaching, training, and story-telling! How: Apply, pay tuition, email, gear, arrive, fun! Cost: $450/student. (includes 2 night’s lodging, 5 meals, 2 days of instruction). For details about the lodge. Tell Mountain Education what type of accommodations you’d like when you apply. To hold your place in the seminar, pay your tuition in full or begin with a deposit payment of $150 via the “Donations/Tuition” tab. Available Rentals: via Clair Tappaan Lodge, also. So, you’re pretty comfortable with getting out on the snow for the day. Now, you want to master sleeping in your tent on it! Is it the same as summer camping? 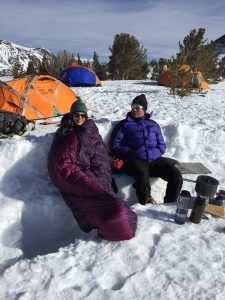 How do you get water, stay warm in your tent, or go to the bathroom? Let us take away your concerns and show you! 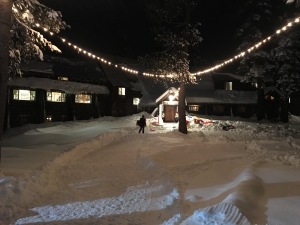 What: Tahoe Overnight Course Description. Distance, Gain, & Elevation: 3-5 miles, round-trip; go up 250 feet; top-out at 8,800 feet. How: Apply, be approved, check Gear List, pay tuition, read email, show up, have fun! 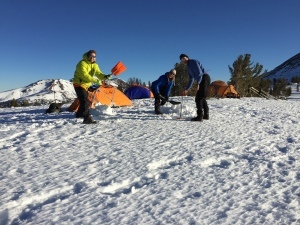 Cost: These classes are available to the public to promote wilderness safety awareness, personal skills confidence, and overall mountain “savvy.” A donation to this charity that provides it is suggested (donation, $300*). Available Rentals: Tents, snowshoes, poles, sleeping pads. This is our original, all inclusive Snow Basics Course (SBC) that we have been teaching since 1982! 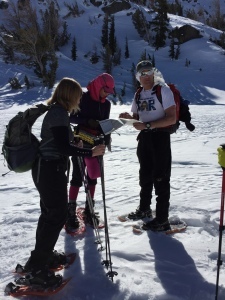 It is a short-distance, basecamp-styled, two-night training trip that includes everything taught in the 1-day and 2-day courses. If you can only take one long weekend off work or away from the dog and plants, do this one!